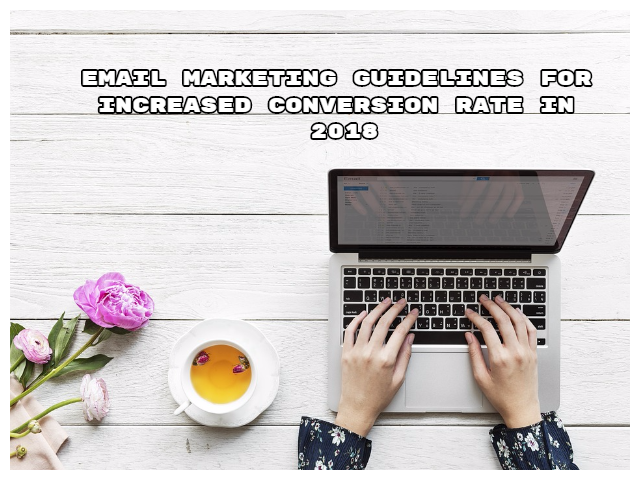 →Email Marketing Guidelines for Increased Conversion Rate in 2018. Email marketing is one of the most effective techniques to promote brand sales and to increase the visibility of the brand in front of the customers. With Email marketing, a company can inform potential customers about the products and the services. It can also be used to convince potential clients to buy more products from the company. Many successful companies have incorporated email marketing into their marketing strategies because the activity of reading email through the smartphones have increased drastically over the years. Marketers use social media channels and engage with the customers to increase sales, but email marketing allows the opportunity to send the product news directly into the inbox of the audience. Technology and social media channels are growing and evolving with time. With changing trends both marketers and SEO needs to keep up with the changes. Just like 2016, 2017 is also a year of marketing. Let’s explore the email marketing guidelines, which we can utilize to improve our email marketing in 2017. We should combine the social media sharing buttons in the email because they increase the conversion rate. Social media sharing buttons allow the user to share the email contents with family and friends. Implementing these buttons in the email design would help the companies to reach a broader audience. If you are planning to increase your product sales, then you need to add innovative and attractive contents to the email design. Your email content is the only thing that can convince the audience to check your products and services. If the contents are boring, then the audience would not bother to read it to the end. The audience always judges the email design on first glance, to decide whether to read it or send it to trash and to keep the audience from sending the email to the trash, you need to add clean and attractive designs. Marketers make mistakes when designing the email and these mistakes kill the conversion rate. You need to avoid these mistakes if you want to make your email marketing campaign successful. With the vast usage of mobile internet, the business companies do not only require to convert their web designs into responsive, but they also need to create an adaptive design for emails. Users do not only use PC and laptops to check their emails. Roughly more than 53% of the users, use their smartphones to log in to their email accounts in order to receive important email notifications on their phones. If your email designs do not have the ability to adapt according to the different screen sizes of smartphones and other devices, then most of your email contents would not be able to display on the screen, which in return will force the users to close the email without reading the contents. How often do you read the contents of the website or email when the images and the contents are not readable and aligned? Create a responsive design for your emails. So, that when the email is opened across different browsers and devices, all the contents are properly displayed. Create an email design that would allow the users to view, order and purchase the products directly from the opened email. Not all the companies send the emails manually, some companies use automated software to reach their customers. So, that they could convert potential leads into customers. With the use of automated software, you can cover large Geographical area and you can reach a large amount of audience with ease. Sending the emails manually is an exhausting task and it also wastes a lot of time, which can be better utilized in finding more customer leads. Automation can help you to reach new heights and increased sales because you would be able to reach a large number of individual consumers. If you want to increase your product sales by utilizing email marketing, then you need to ask yourself a question that how do you plan to maximize the sales by efficiently utilizing the marketing campaign. Email marketing is already used by dozens of companies and how are you going to outsmart your competitors? If you are new in the industry, then you are already far behind your competitors. Since email marketing can give direct access to the inbox of the customers, it is obvious that your rivals are already utilizing this technique to double their sales. But not all the companies utilize this strategy correctly which render all of their email marketing effort useless. But you can adapt the above-mentioned guidelines in 2017 to gradually catch up to your rivals. Vishwajeet Kumar is a Pro blogger and digital marketer. He is founder and Author of Blogwithvk.com. He loves to write on topics related to technology, Marketing, Business, Internet, etc. He also loves to connect with people worldwide and help to become successful in their online ventures. Nice post Vishwajeet. But I wanted to know your opinion about push notifications and whether they are a suitable replacement over email marketing. Glad you like the post. Push Notification is a great way to engage visitors coming to your blog. However, It can’t be a replacement for email marketing. Email marketing has its own benefits. Both are different things. Thanks for stopping by. Email ecan get us more customers in a lead generation website but the conversion rate might be quit low for email marketing. Website traffic might come in handy. I am Mayank, Really helpfull post buddy its very amazing article i learn from this article.Really amazing post man. I think effective email marketing starts at the point of lead capture. If you don’t have your acquisition strategy right, then everything else is 10x as hard. I literally reviewed every landing page tool on the market just the other day and put together the ultimate landing page guide. I cover pretty much every tool you can find and there are certainly some that are better at acting as a lead capture tool than others. Email marketing is like backbone to almost every business vertical now a days. It is one of the best way to promote your brand and reach out to right customers at right time. It is also very much effective and cost effective in compare to any other marketing medium. Yes, Email marketing is very important for any type of online business. It is more beneficial for affiliate marketers who are doing affiliate marketing with their blog. Thanks for stopping by.